Beautiful plants and high-quality landscaping can do a lot more than make your home or business exterior look good. An abundance of plants may actually do wonders for your overall health. From lightening moods to better airflow indoors, plants improve our lives as well as our spaces. Adding plants to your home or office and maintaining your landscaping are great ways to stay active while improving the look of your home. 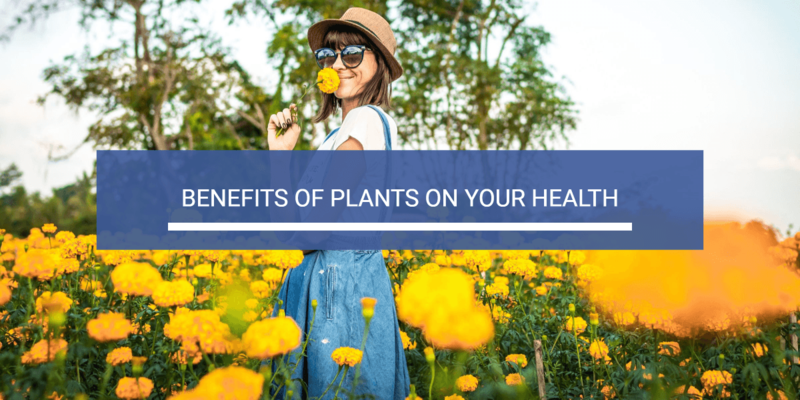 To help you get started with gardening or landscaping, we want to detail some of the top benefits of plants when it comes to your overall health. If you’re someone who likes to regularly maintain your landscaping, you may already know that outdoor yard maintenance promotes physical health. Even in small yards, actively maintaining your outdoor space requires significant physical activity, from walking to mow the lawn or heavy lifting for new landscaping projects. The average lawn in the United States is around a quarter of an acre, according to Home Advisor. Regular lawn maintenance, planting, pruning, and landscaping in a yard that size can result in multiple hours of work, including great cardio exercise from frequent walking. Your plants shouldn’t be limited to the outdoors alone. Your indoor space can benefit greatly from fresh plants, whether that’s your office or your living room. Plants improve the overall air quality of your indoor space by filtering out some of the pollutants in the air and promoting clean oxygen. Alternate tall potted plants with small flowers on tables and counters to add contrast and color to your space. Direct sunlight is important for indoor plants, so try to keep them as close to a window as possible. Don’t forget to regularly water all of your indoor plants as well as your outdoor plants. With proper care and maintenance, you’d be surprised at how long indoor plants can actually survive, meaning you’ll have the great health benefits of plants all year long. According to a recent study, plants actually have a positive impact on overall mental health. When subjects were evaluated after performing tasks that involved indoor plants versus common computer tasks, participants responded much more positively after interacting with indoor plants. Even if your day to day job doesn’t involve plants, simply having plants around you during the day may boost your mood. In addition to better moods, indoor plants have also been linked to increased productivity in the workplace. Offices with minimal natural light and few plants are often seen as dreary and stressful. By adding a few plants and maximizing natural light, the entire office can be more productive. From simple landscaping updates to complete outdoor renovations, landscaping is a great way to improve the look of your home or business. Increase the value of your home, create a relaxing outdoor space for you and your family, and improve your overall health through the natural health benefits of plants.